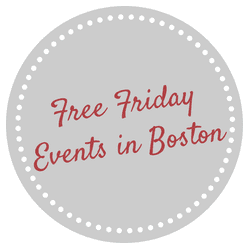 Free Friday Events for Friday, July 18, 2014 in Boston! Every Friday this summer, there will be so many free and fun events happening in Boston and Massachusetts. Every Wednesday this summer I will do a roundup of events especially for Friday! Here are the free events in Boston for Friday, July 18, 2014! Bike Friday: Bike to work with your fellow commuters and enjoy a free breakfast and more at City Hall. Artbeat 2014: July 18-19, 2014 in Davis Square is a free and innovative arts festival. Make sure to check out my 27 Free Things to Do in Boston, Free Fitness Events in Boston for Summer 2014, and The Complete Guide to Saving at Fenway Park if you are looking for more ways to save money this summer in Boston.